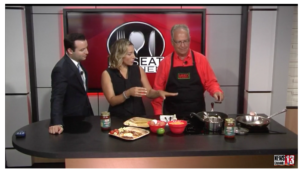 Join Larry Sombke and CH 13 News Anchors Karen Tararache and Greg Pollack as Larry shows them how easy it is to make delicious Huevos Rancheros using Larry’s All Natural Ranchero Sauce. The fresh jalapenos, onions, cilantro and garlic give Larry’s sauce a bright, authentic Mexican flavor. 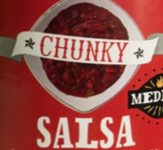 Pour one jar of Larry’s All Natural Ranchero Sauce in a small saucepan and heat until hot and bubbling. Place the cooked eggs on top of the tortillas, spoon 1/2 cup Larry’s All Natural Ranchero Sauce over the eggs and sprinkle with the grated cheese. Serve each plate with a wedge of lime and squeeze the lime juice over the huevos rancheros.